Ireland finished a creditable 13th at the 15th edition of the Amputee Football World Cup held in San Juan de los Lagos, Mexico. 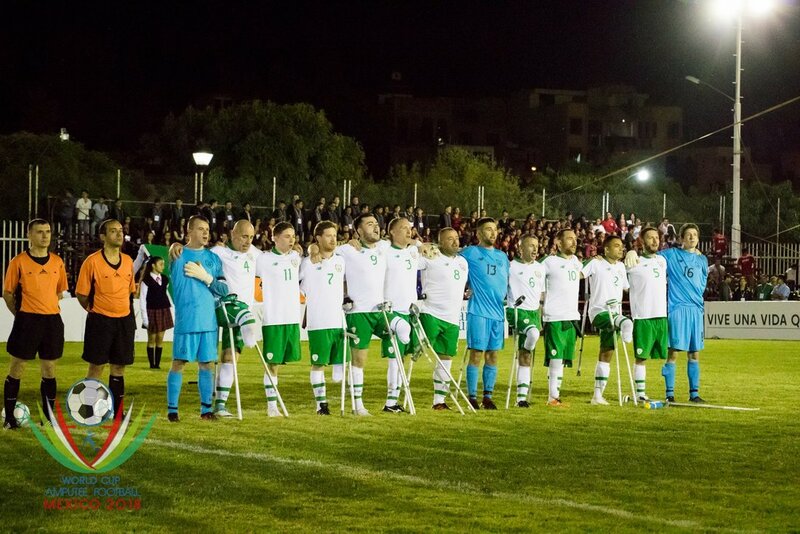 Exiting the tournament proper to European Champions and eventual World Cup finalists, Turkey, in the round of 16, Ireland battled through the placing fixtures, recording wins against Columbia and Italy, to move up five places in the World Amputee Football Federation rankings. In only their second appearance at a World Cup finals Ireland showed a marked improvement on their 2014 performance losing only to sides that finished in the final 6 (Mexico 4th, England 6th, Turkey 2nd). The squad missed out on the opportunity to place in the top 12 by the very narrowest of margins, losing to Kenya by the odd goal in a penalty shootout. A 4-1 win against Uruguay in their final group game was a highlight of the tournament for the boys in green. Written off following defeats to hosts Mexico (1-3) and European finalists England (0-3), Ireland hand it all to do going into their final group game. Ireland had to win by at least 3 goals and had to score at least 4 times to advance but braces from both James Boyle and Kevan O'Rourke sealed an historic victory. Defeats to the extremely talented Turks (0-4) and a very hardworking Kenyan side (1-1, 3-5 pens) followed but the Irish squad were not done. Another brace from Boyle and a clean sheet from Fergal Duffy against Columbia (2-0) set up a 13th place decider with Italy on the final day. The sides had met on three previous occasions but never before had Ireland beaten the Italians (2015: 1-2, 1-2, 2017: 0-2). Determined to atone for their narrow loss to Kenya and eager to finish as high in the rankings as possible Ireland recorded an emphatic 4-1 win against the Azzuri. Boyle's first hattrick for Ireland and a goal from O'Rourke ensured that our boys in green finished on a high. 2018 was a landmark year for the IAFA as it established the Irish National Amputee Football League. 12 of the 13-man squad that travelled to Mexico participated in the inaugural season of the National League. 4 of the squad, introduced to the amputee football through the league, made their International debuts in 2018. The future is bright for Irish amputee football and if participation in the National League continues to grow in the coming years the sky is undoubtedly the limit for our International squad. The IAFA, players, staff and committee alike would like to sincerely thank all those who have supported the association throughout 2018. From sponsors, to those who donated to our fundraising campaign, and to everyone that supported the clubs and International squad throughout the year we cannot thank you enough. Without your generosity and support our World Cup journey would not have been possible. Thank you. Ireland will compete at the 15th edition of the Amputee Football World Cup that will be held in San Juan de Los Lagos, Jalisco, Mexico between October 27th and November 4th. They will compete in Group A against hosts Mexico, neighbours England and newcomers Uruguay. Following the inaugural season of the IAFA national league and months of International trials a squad of 13 has been chosen to represent the IAFA at the tournament. Evhe IAFA welcomed England and Poland to Dalymount Park on May 4th and 5th for a series of International friendlies sponsored by Citywest Hotel. The International tournament was held as part of the European Amputee Football Federation's Football Weeks initiative. All three teams, who had finished in the top six at last year's Amputee Football European Championships, competed over the weekend at the original home of Irish football. England emerged as victors, beating both Ireland and Poland, without conceding a goal. Poland finished second, edging Ireland in an edge-of-your-seat encounter which saw both sides throw caution to the wind, in a 6-goal thriller on the final day. The series was a roaring success. Fans flocked to Dalymount to see the boys in green in action. This was the first opportunity Irish supporters have had to see our Irish amputees play on home soil in five years. The games were also streamed live and thousands tuned in both at home and abroad to cheer on their national sides. The IAFA would like to extend its thanks to Citywest Hotel, the FAI and Bohemians FC for their support in hosting this event. Ireland kicked off the weekend against rivals and near neighbours England who last year finished runners-up at the European Championships in Istanbul, Turkey. England showed their class early on and were a goal up midway through the first half. Michael Chambers skipped past three Irish players before laying off to David Tweed who finished past James Conroy. Ireland defended resolutely for the remainder of the game and repelled each English attack unable to create to many clear-cut chances of their own. Garry Hoey made a string of exceptional tackles to keep the English at bay while Irish captain James Boyle endeavoured to get Ireland back into the game. England were awarded a penalty late in the game as Jamie Tregaskiss was taken down by James Conroy. Conroy saved low to his right from Michael Chambers, however, to keep the difference between the two sides to the minimum. The result was a repeat of the European Championship group stage game between these sides last October. Three Irish players also made their debut on the day; Fergal Duffy, Ruairi Murphy and Stuart McEvoy each wore the green jersey for the first time against England. England played Poland, who had finished third at the European Championships, in the second game of the tournament. Goals from Michael Chambers and Jamie Tregaskiss were enough to secure victory for England. The tournament finished on a high with a incredibly entertaining game that produced six goals. Poland, who had earlier lost to England, started the sharper and scored three goals without reply during a five minute spell. With goals from Kristian Kaplon, Dawid Dobrowski and Bartosz Lastowski Poland looked to have Ireland shell-shocked but within minutes Ruairi Murphy had found the back of the Polish net. James Boyle dribbled through midfield before finding Murphy in space who slotted calmly past the Polish keeper. Ireland then further reduced the deficit before the break. Captain Boyle struck low finding the net from range to make it 2-3 at halftime. Ireland pushed for a equalizer in the second half. Christy McElligott came agonizingly close on more than one occasion to meeting crosses into the box and Poland made a number of last ditch tackles to keep Ireland out. Poland were awarded a penalty midway through the half which Fergal Duffy saved. Lastowski was quickest to the rebound, however, and Poland ran put 4-2 winners in a pulsating game. Ireland finished an impressive 6th at the European Amputee Football Federation's first European Championships in Istanbul, Turkey. The competition that was won by hosts Turkey saw 12 teams from across Europe compete over 7 days for their European ranking.